October 8, 2009 by Ken Ward Jr. 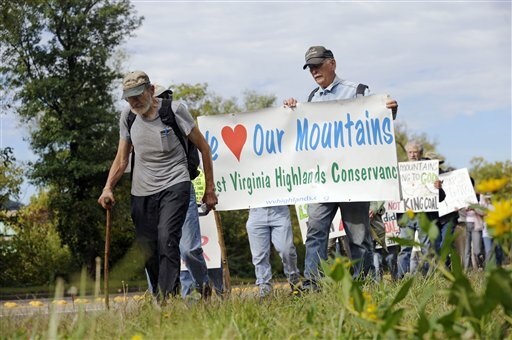 Eight environmental activists between 50 and 83 years old began the first leg of a five-day, 25-mile march today to protest mountaintop removal mining practices they believe are destroying communities and lives across southern West Virginia. Led by 81-year-old military veteran Roland Micklem of Savannah, N.Y., the toes of his black boots held together with duct tape, the group set out from the gold-domed Capitol, heading east along the Kanawha River with about a dozen younger supporters. Inspired by the recent actions of younger protesters who have risked arrest and personal injury, Micklem organized the senior citizens’ march to show support. His Christian faith, he said, is also a motivation. Other supporters will join the marchers periodically as they make their way to Massey Energy’s Mammoth mine in eastern Kanawha County on Monday. Jama Jarrett, spokeswoman for the state Office of Miners Health, Safety and Training, said only the underground portion of that mine is operational. The march — organized by Climate Ground Zero, Mountain Justice, Intergenerational Justice and Christians for the Mountains — came the day after a pro-coal rally that drew nearly 200 people to the statehouse. At that event, three environmental protesters were heckled, mocked and accused of trying to destroy good-paying jobs in a part of West Virginia that has few. All year long, environmentalists have been staging acts of civil disobedience aimed at stopping mountaintop removal, most targeting Massey. 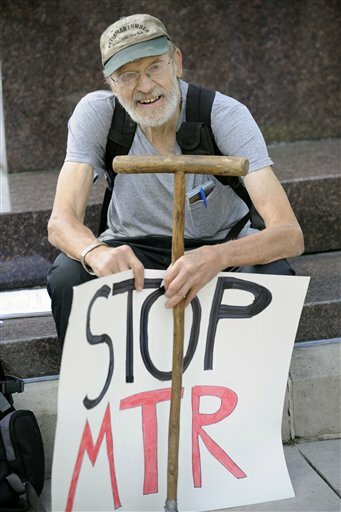 But 73-year-old Julian Martin of Charleston said the protests are not against coal. They’re against a particularly destructive form of mining it. Martin’s father and uncles were underground coal miners, he said. His grandfather was in the Battle of Blair Mountain, where some 10,000 miners trying to unionize fought police and federal troops in what some historians call the largest armed uprising in America since the Civil War. Mountaintop removal mining involves blasting apart ridge tops to expose multiple seams of coal, dumping debris into valleys and flattening what had been peaks. Virginia-based Massey and other coal companies say that’s the only way to reach some reserves, and they argue they reclaim the land so it can be developed for commercial or other uses. Critics, however, say the land is ruined forever, and that both people and property suffer from the rock, dust and vibrations that accompany blasting. Danny Chiotos of Charleston, youth organizer for the Student Environmental Action Coalition, praised Micklem and the other seniors for a fight against strip mining that dates back four decades. Video from day 1 of the march. I will be uploading an update video each day until it’s over. Why didnt they march to a active MTR operation? Massey hasnt striped one ton of coal from this site. Cannelton and the umwa were the ones who striped this property. I would imagine that the site choice has to do with having wide roads to walk – for the safety of the elderly. I think that another safety issue is being closer to police enforcement and not in remote areas to discourage pro-coal people against acts of violence and threats against the peaceful elderly protesters. Your probably correct Hollergirl. I hope they have a nice, safe walk. Nice time of year with the leaves turning. It still seems strange though. If I were to protest a act by congress, I wouldnt go to Kanasas to do it.